Finally, we get the long view from historian Tracy Campbell, author of Deliver the Vote: A History of Election Fraud, An American Political Tradition. Whether it’s the charge that “greedy geezers” are robbing the next generation or hand-wringing over the national debt, pundits and politicians in both parties have been claiming for years that we have to cut Social Security. The attacks on what has been called America’s most effective anti-poverty program have abated slightly this election season — thanks largely to Bernie Sanders and Elizabeth Warren — but my guest Steven Hill says don’t heave a sigh of relief yet. We have yet to see if the attacks will resume after Election Day. 40% of retirees depend entirely on Social Security for their income — but the benefits are barely above the poverty level — averaging about $1500 a month. Most Americans want to expand Social Security — and that includes most Republicans. So why is it under attack? 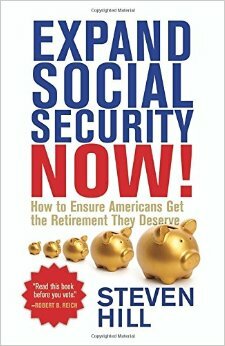 That question is answered in Hill’s book, Expand Social Security Now! He also explodes the myths being spread about Social Security and shows how we can strengthen it for current and future generations. Steven Hill is the author of six books about politics. He is a Senior Fellow with the New America Foundation. Listeners to this program know that ever since Francesca worked as a poll worker in the New York presidential primary election in April 2016, she has been concerned about the fairness of our elections. Unlike Donald Trump, she’s not worried about voter fraud. But she is worried about other threats to our election system, like voter suppression and the possibility that our antiquated voting machines may be vulnerable to manipulation. That’s why Bev Harris’ new research caught our attention. She’s the creator of Blackboxvoting.org, a nonpartisan investigative reporting and public education organization about elections. It’s like Animal Farm in the voting booth — in George Orwell’s tale, all animals were equal, but some were more equal than others. Here, all votes are equal, but some are more equal than others. Harris says some votes, especially those of minority voters, are being assigned values of less than 1, while other votes are getting values that are greater than one. Bev Harris Web Extra: Are Minority Votes Worth Less Than Other Votes? Donald Trump has made a lot of self-serving claims that the election will be rigged — entirely without evidence. In reaction, big media and politicians from Barack Obama on down on the Democratic side are very keen to convince the American public that election fraud is almost impossible to do. But it turns out that America has a long history of election fraud dating from before the Revolution — and it’s been a robustly bi-partisan affair. It also has disproportionately hurt minority voters — and this election may be no different. 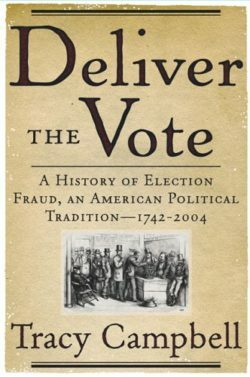 Tracy Campbell is the author of the acclaimed book, Deliver the Vote: A History of Election Fraud, an American Political Tradition, 1742-2004. We spoke to him at length about this history — and his concerns that Trump’s claims muddy the waters. Tracy Campbell is Professor of History at the University of Kentucky.